Located in the heart of Helsinki, the Radisson Plaza Helsinki places guests moments away a myriad of attractions and public transportation connections. The Grand Casino Helsinki, Finnish National Theater, and Museum of Contemporary Art are all within walking distance of this Helsinki accommodation, and other attractions can easily be reached via public transit. 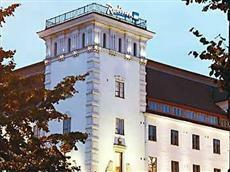 A bus station, underground terminal, and tram stops can all be found near the Radisson Blu Plaza Hotel Helsinki. The Sas Radisson Plaza Helsinki contains a total of 235 well-appointed rooms and suites that feature classic Italian or Nordic-inspired interiors. In-room amenities include satellite TV, dial-up Internet connections, and mini-bars. Meals prepared with the finest and freshest ingredients can be sampled in the Sas Radisson Plaza Hotel Helsinki’s award-winning on-site restaurant, while light snacks and drinks can be obtained from the refreshment bar. Business travelers can make use of the hotel’s spacious meeting and banquet facilities, which come equipped with modern technology to help ensure meetings and gatherings are more successful. At the end of the day, guests can work out in the gymnasium or simply relax in the sauna.